Schematic of p-i-n perovskite solar cell architecture (c) with respective energy band diagram relative to vacuum level. (d) Typical scanning electron micrograph of perovskite solar cell. (e) Schematic of perovskite filling nanoporous NiOx flakes. Perovskite materials promise low-cost, highly efficient, flexible solar photovoltaic devices. But the best power conversion efficiencies reported to date have been for polymer-based electron- and hole-conducting layers, which are highly sensitive to air and moisture. 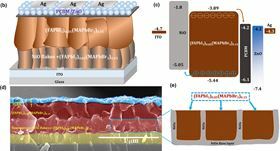 Now researchers from Chonnam National University in South Korea have developed a simple chemical process to create more resilient metal-oxide based hole-conducting layers for perovskite solar cells with comparable efficiencies [Mali et al., Materials Today (2018), DOI: 10.1016/j.mattod.2017.12.002]. The team, led by Chang Kook Hong, synthesized p-type nanoporous nickel oxide (NiOx) thin films as the hole transport layer (HTL). The pinhole-free nanoarchitecture is optically transparent and enables higher hole conduction than conventional organic/polymeric hole-conducting layers. But since this perovskite material is highly sensitive to air, the researchers added an air-stable, n-type ZnO nanoparticle electron transport layer (ETL) over the top. The NiOx also serves as a more effective charge extraction layer for the perovskite than traditional polymeric materials. The result is that p-i-n type inverted perovskite solar cells based on the NiOx thin films show fast electron transportation and low recombination rate, contributing to an efficiency of over 19%. The NiOx-based solar devices are much more stable in air than polymer-based alternatives. Without additional encapsulation, the devices showed little deterioration in performance after more than five months. By contrast, polymer-based devices deteriorated over the first few days and were completely dead within five days. Currently, the hole-electron mobility is still rather low, but the team is confident that suitable doping could improve the situation. The researchers are now working on Li-doped NiOx and Mg-ZnO to boost hole and electron mobility. “Large-area deposition using spin coating is also a big obstacle,” admits Mali. “Other coating techniques such as ultrasonic spray or roll-to-roll processes would be the best choice to move toward commercialization for this type of PSCs,” he suggests. The researchers are now working on ultrasonic spray techniques for large area perovskite devices that they believe will offer a new approach to highly efficient, air-stable solar cells.